In this beautifully nuanced dark comedy, a 9/11 widow and her son, Hamlet, have retreated from Brooklyn to the idyllic rural countryside upstate, where for nearly eight years they have run a sustainable farm. Unfortunately, their outrageously obese neighbors, who prefer the starchy products of industrial agriculture, reject their elitist ways (recycling, eating healthy, reading). Hamlet, who is now eighteen, is beginning to suspect that something is rotten in the United States of America, where health, happiness, and freedom are traded for cheap Walmart goods, Paxil, endless war, standard curriculum, and environmental degradation. He becomes very depressed when, on the very day of the 8th anniversary of his father's death, his mother marries a horrid, boring bureaucrat named Claudius. Things get even more depressing for Hamlet when he learns from Horatio, a conspiracy theorist, that Claudius is a fraud. The deceptions, spying, and corruption will ultimately lead, as in Shakespeare's play, to tragedy. Locus Amœnus is a thoroughly clever Young Adult novel loosely based on Shakespeare's Hamlet. When Hamlet is told by an old friend Horatio that 9/11 was covered up, with help from his new stepfather, he becomes depressed and wants to set things straight. First off, I loved it! Full of snappy wit and a British sense of humor. 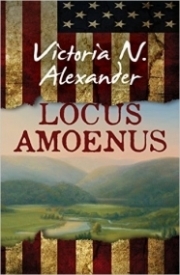 Locus Amœnus will appeal to young adult readers because of its young protagonist vs. the World theme, but this time, dragons and magic are not necessary to paint a real world dystopia. Obesity, poor education, and corrupt government all contribute to Hamlet's world. In terms of style, I am reminded of Pseudonymous Bosch (minus the asterisks containing page-long tangents). Alexander is much more poetic that Bosch, and not as crazy, but they both have the same fast and cunning sort of humor. John Green comes to mind as well. When Alexander describes a wellness committee meeting, with the morbidly obese school nutritionist, I was reminded of when Green describes a cancer support group, with Patrick, the group leader who insists on singing songs. Both writers use parody well. John Green is slightly mellower, though. This reminds me of the ending of Pseudonymous Bosch's Bad Magic where we a given a hint that the narrator is in fact one of the main characters. Fast paced and funny. Great writing style. Ophelia, the goth girl.